Crystal Palace star Ben Watson has joined Wigan Athletic for £2million. The midfielder was set to sign for Middlesbrough last week but the move collapsed after Watson reportedly failed to agree terms. This alerted Wigan manager Steve Bruce who persuaded the Palace Academy graduate to pen a three-and-a-half year deal after the Latics matched the transfer fee. Watson, 23, is relishing the prospect of a return to the Premier League after an unsuccessful stint with Palace in 2005. "It's great to be back in the Premier League," said Watson. "Steve Bruce is the big pull here, it's a great time to be joining the club and I'm joining a team who are really flying. "I want to thank everyone at Palace, and all the supporters, because they have been great to me, but this is a terrific opportunity for me to play in the top flight again and I just felt the time was right for a move for me. I just can't wait to meet everyone and get started now." Bruce said: "We have been watching Ben for some time and believe he has the maturity to step back to the highest level and make an impression. He's a midfielder who scores goals. He's got quick feet, plenty of power and is a terrific prospect. "I wanted to move quickly to start filling the gap left by Wilson Palacios and Ben is the start of that process." Bruce added: "It speaks volumes about the progress of the club that we can compete with established Premier League clubs for players and I am delighted that Ben has agreed to join us. I think our supporters will take to him quickly because he's a real hundred percenter." 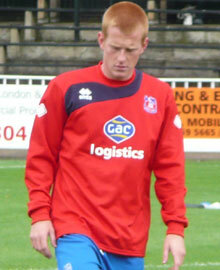 Watson made his debut against Watford aged 17 in 2003 and played 189 times for the Eagles, scoring 20 goals.